Mouse Teeth and the End of the Dentist as We Know It. 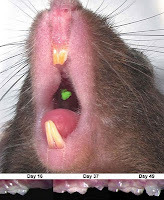 A mouse has grown a new tooth in place of a lost molar. But hold on! We've all done that as a kin. Well the news is it's a tooth that come via a new breakthrough in bioengineering. It has the same performance properties of the old tooth, and is strong and durable enough to allow the mouse to chew food normally over it's life. To create the new tooth, the researchers @ Tokyo University of Science took 'Epithelial' cells and 'Mesenchymal' cells (about 50,000 each) from a mouse embryo and cultivated them together in a collagen-based medium to create a tiny tooth bud — a mass of tissue that has the potential to develop into a tooth. They then implanted the 0.5-mm tooth bud into the jawbone of an mouse in place of a lost tooth. After 37 days, a new tooth sprouted, and after 50 days, it had grown to the same height as the adjacent teeth. The bioengineered tooth has the same hardness as ordinary teeth and it contains vessels and nerves, making it sensitive to external stimuli and pain. This research is expected to advance the development of 'tooth regenerative therapy,' which one day will allow doctors to replace diseased or damaged teeth with bioengineered teeth grown from stem cells such as induced pluripotent stem (iPS) cells. This type of treatment could not only ultimately eliminate the need for dentures and false teeth, but grow artificial teeth with new performance properties. Imagine: once you have your new set, no more dentist, self-cleaning teeth, super-strong, and eventual teeth grown to your own design specification. Within a decade, start looking out for designer teeth shaped as Jewelry!!! Goldie watch out. Click here and see! 'Living Doll' Composed of Collagen Cells. Researchers created the tiny figurine by cultivating 100,000 cell capsules of 0.1 millimeter balls of collagen, each coated with dozens of skin cells. 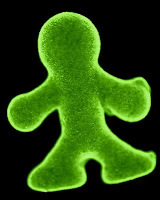 After the cell capsules had coalesced to form the doll-shaped mass of tissue, it was placed in a culture solution, where it reportedly survived for more than a day. The researchers also successfully tested the biofabrication method with human liver cells. The technique can laso be used to create bodily organs and tissues with complex cellular structures, which may prove useful in the fields of regenerative medicine and development. This is merely the beginning. Click here to discover more in the fantasic journey of the emerging Bioworld. The Manchester Institute of Innovation Research (MIIR) are working on an EU project for uses of Futures Studies on government policy in an attempt to adapt to an ever faster, more discontinuous world. MIIR point out that when we consider a major futures driver such as breakthrough or disruptive technology (self-assembled nanobots, holographic microprocessors, £495 desktop 3D printers @ home, artificial telepathy - all noted in this blog over the years) people tend to ask what is feasible and what we are sure will work. We are less likely to ask what we want, what is desirable, what we need to get on. The analysis methodology shows that geopolitical and security issues generate most Wild Cards and Uncertainties; that new science and technology produce most discontinuities; and that society and culture produce the most Weak Signals hinting at the future. (1) Environmental and financial crises as the biggest issues for the period from 2010 to 2016 (e.g. ; mass displacement, little money in pocket, global financial melt down). (2) Aging population from 2016 to 2025 (e.g. ; people living longer however with ill-health, so pension funds dry-up, and then no Beer at the Inn). (3) While climate change and fundamental resource scarcity (e.g. ; Siberian winters in Spain and higher Oil, Water, Pizza prices) are the main concerns beyond 2025. What I would ask is that MIIR now move on to issues that concerned nations are not already addressing. For example, what of the interdisciplinary impact across these issues? How they act as a complex interconnected system? Further, what of the technologies not yet on the strategic agenda, yet will turnout to not be merely instrumental in solving critical problems, but make them wholly irrelevant. As I say people tend to look and ask for what is feasible, what is sure to work. Because it's safe, more politically inert, and in the short-term keeps the wolf from the door. As a result, we are much less likely to ask what we want, what is desirable, what we need to get on. Further, even some of the most forward futurists back down, almost intuitively, on cutting-edge breakthrough innovations and archetype events. For example, what are the 'new laws of economics' not only in an interconnected world, but in a world of instant production in your home. What happens to the distribution infrastructure, when most things - from cloths to computers to mosquito nets - are made of diamondoid nanostructures @ home or a tree house or shack by a smallish size device, that's mains gas fed? What happens to abject poverty when nanomanufacturing hits a point when it can instantly produces hot soup and a roll from raw soil, waste and even sewage? What happens to the economy, the ecolology? And one of the biggest human cultural questions of all: 'What will change everything.' Is there anything on the horizon that will? Please click on and see. In sum: we need to look at the future with much deeper systemic foresight; and take a courageous look at the many archetype issues not yet on the map. Anyway, please click here for slide presentation.